The SCAPA infrastructure is part of a major refurbishment of the John Anderson Building at the University of Strathclyde. It consists of ~1200 m2 total area comprising shielded areas, laser labs, preparation labs and control area. 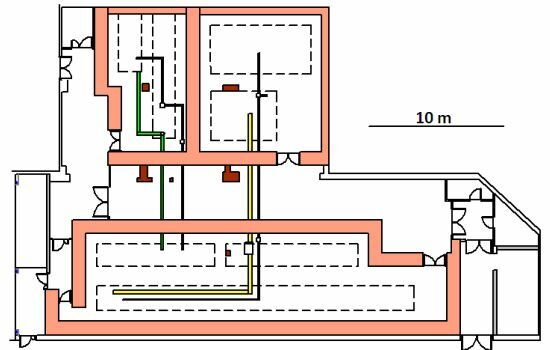 There are 3 shielded areas for a total of 7 accelerator beam lines and 300 m2 total working space (compared to 37 m2 for the old ALPHA-X shielded area). The SCAPA laser labs are located on top of the shielded areas. 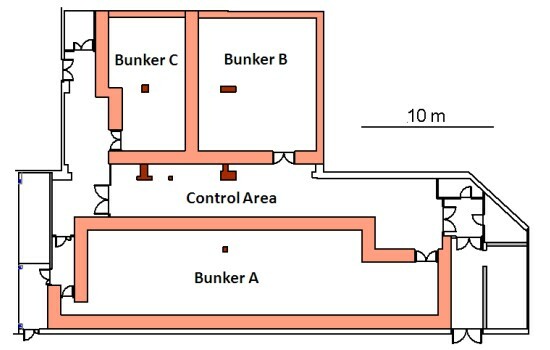 The interior of radiation shielded area “Bunker A”. Layout of Level 1 shielded areas and control area. 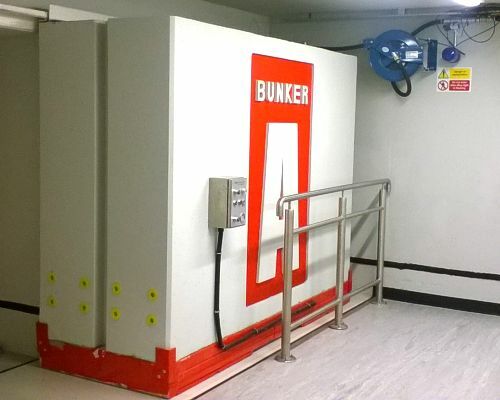 The laser labs are situated above the bunkers. 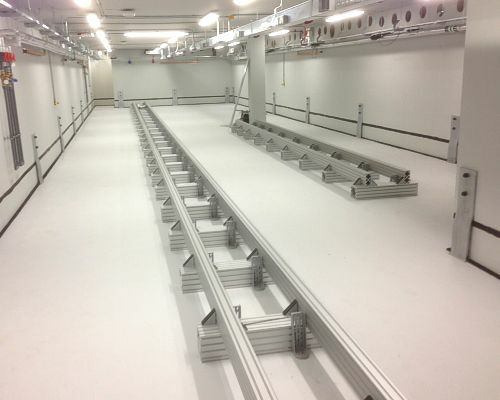 Beamline areas in the bunkers. 350TW main and probe laser beams emanate from Bunker A. Those for the 40TW laser system emanate from Bunker C.
The workhorse for the ALPHA-X laser wakefield accelerator beam line since 2007 has been a 40 TW (1.4 J, 35 fs, repetition rate of 10 Hz) Ti:sapphire laser system. This laser will drive 3 beam lines in SCAPA, including ALPHA-X. In addition, an entirely new Ti:sapphire laser system has been procured for SCAPA. It will produce 8.75 J, 25 fs pulses at a repetition rate of 5 Hz, corresponding to a peak power of 350 TW (world’s highest average power laser of its type), and will drive 4 of the SCAPA beam lines. There is potential for future upgrading to PW capacity. This new laser system was recently commissioned in early 2017. Control Area for radiation beam lines control and data acquisition. 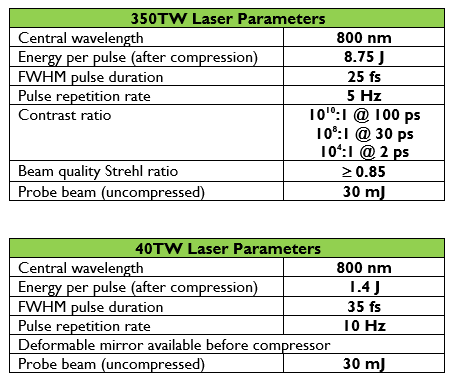 kHz repetition rate Ti:sapphire laser system for plasma accelerator development and characterisation, a femtosecond laser micromachining station, diagnostic development, etc. 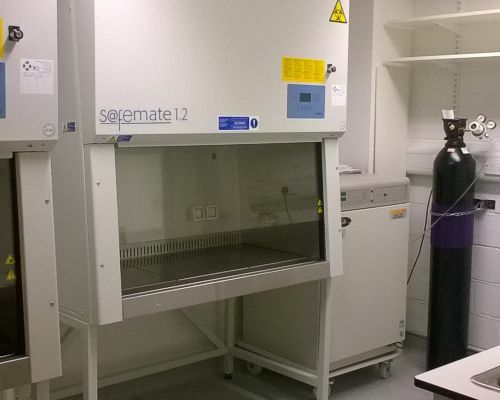 bio prep room with biological safety cabinets and incubator. chemical prep room with fume cupboards. imaging room with imaging plate reader and film scanners. 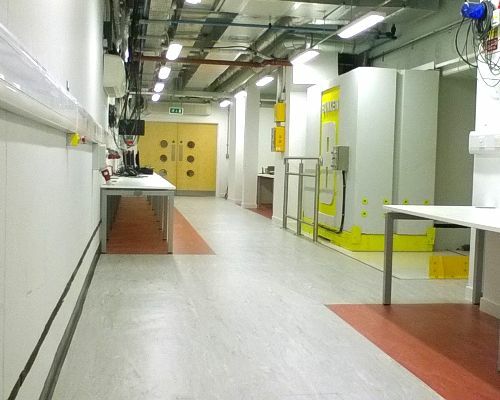 radioisotope sealed source room for X-ray and gamma ray detector calibration. Bio prep room for off-line cell work. One of the radiation shielding concrete doors.